Spending the day with family and friends hanging out on the water can be one of the most enjoyable ways to pass time. If you have children, include them in the fun! The prospect of boating with children doesn’t have to be intimidating, as long as a few precautions are taken first. It’s not a bad idea for everyone on the boat to wear a life jacket, but for the children, it should not be optional. The life jacket should fit snug and have a collar that will turn your child face up should they fall into the water. The jacket should be adjusted to fit close to the child’s body and not ride up above their chin. You might even consider choosing a life vest with a crotch strap to keep it from doing so. 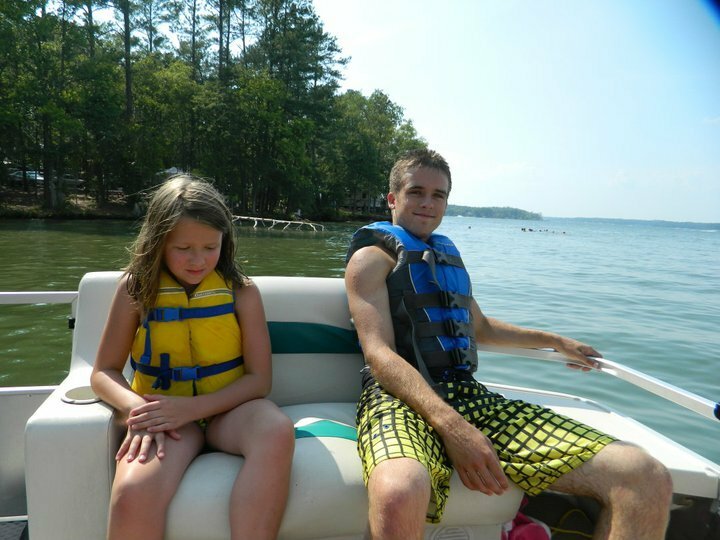 Have them practice wearing the life jacket so your child will be comfortable with it in and out of the water. For more information about life jackets, Visit USCGBoating.org. When you involve your children in the boating preparations, they feel a sense of responsibility. Assigning “jobs” to the kids in your party can do double-duty when it comes to the day’s plans. They feel involved and important and you have some helpers! Let one be the “safety inspector” that checks for all the necessary equipment such as a fire extinguisher, life vests, and first-aid kit. Assign another child the job of “equipment master”. This person keeps all the gear stowed and out of the way, which teaches the importance of being tidy in a small area and ensures a safe and accident-free day on the water. These are just a few of the possibilities for job assignments. Get creative and get the kids involved! It might sound a bit strange, but hold a safety meeting before leaving the dock. Go over the “rules” with the kids. Let them know there is no running and they should be seated when the boat is in motion. Also stress the importance of keeping the life vest on at all times. Go over hand signals that are used while tubing or skiing. BoatUS is a great source for hand signals. This is also a good time to assign those “jobs” mentioned above. Enroll your child (and yourself!) in a boating safety course. Most states provide this service free of charge through the Department of Natural Resources. These courses are essential to learning the basics of safe and responsible boating. Contact your state’s DNR for a list of upcoming courses in your area. Boating can be an enjoyable and memorable activity for a family to enjoy together. Following these tips and suggestions promises to keep everyone safe and boating for years to come!